As you all might know I've been a huge fan of Jordandene for years now. She has been so kind to me throughout the years that I can't do enough to sing her praises. You might have saw that we teamed up for a collaboration tank! Well guess what?! It is still available but now in NEW colors! I thought I loved them before, I love them even more now! They are even softer than before! 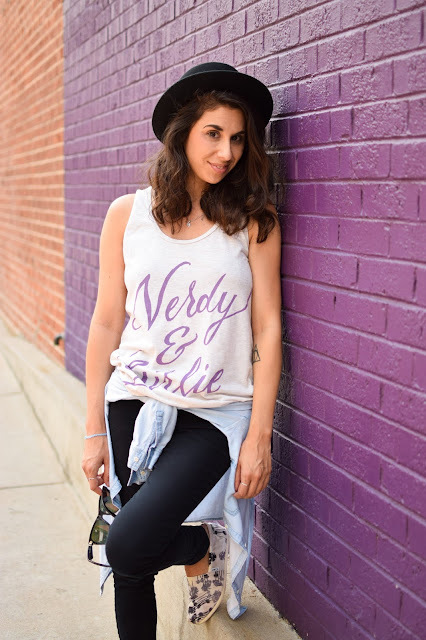 So with the new options available to you nerdy girlies, I decided to share a couple new looks for you! My go too look any day would be TOMS, my favorite comfy tee and a chambray cover up! I love making it hipster with a headband and DIY ripped jeans! I love mixing it up with a hat as well! Thank you to my lovely Studio Assistant, Mae at Bloom Portraits for taking this awesome picture of me! I might be a bit obsessed with the pin mania that is happening lately. So my jean jacket pin collection is ever growing. 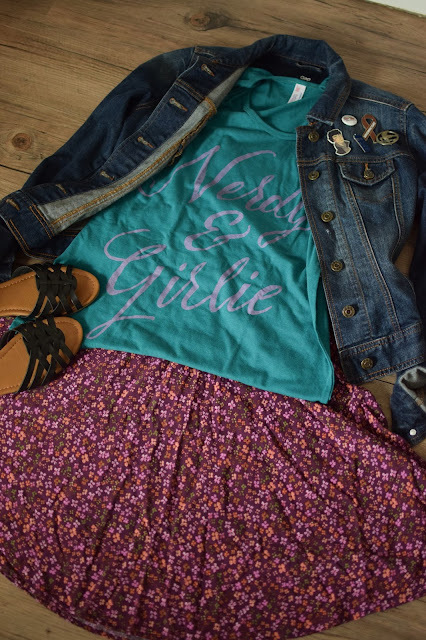 To take our nerdy & girlie tee to a girlie level I added this pretty flower skirt and kept it nerdy with the pins! Which look do you like better?! Somedays I'm super girlie, but most of the days I just love a good tank and my black pants! What about you?! 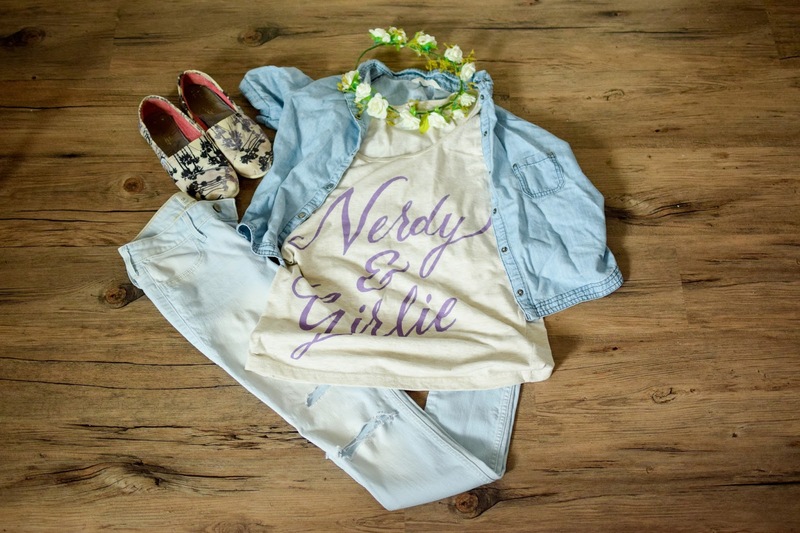 Ready to join the nerdy & girlie team?! 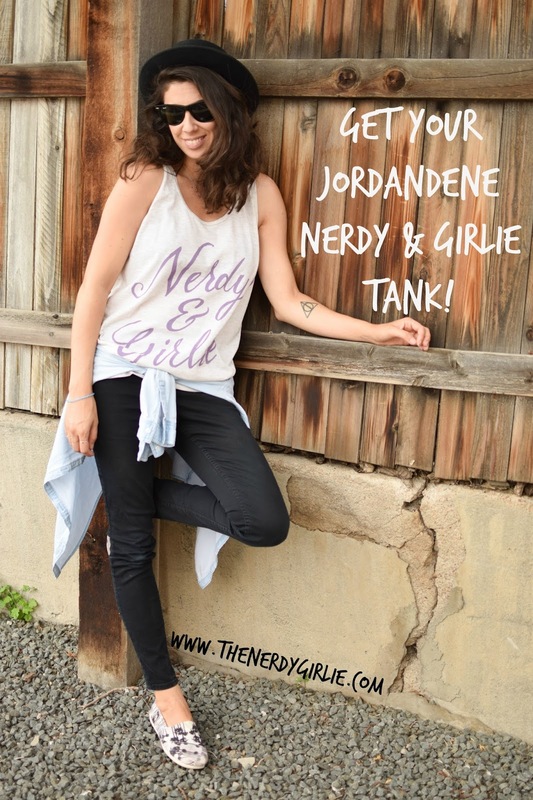 You can purchase your tank over on Jordandene's site now!